York’s medieval walls, England’s longest surviving example, stand on the line of earlier fortifications dating back to the Romans. From high on the walls, there are views of the Minster and other ancient buildings, which are explored in the walks that follow. Cross the road outside the railway station and turn left. At the junction, keep straight over the road towards the statue of George Leeman and turn immediately right through the arch. Climb the steps onto the walls and walk back past the station. Continue round the corner ahead, to Micklegate Bar (1), chief of York’s four main medieval ‘bars’ (or gateways) where the severed heads of traitors once topped the walls. It’s now home the Henry VII Experience, the first Tudor king. Take a detour down onto Blossom Street to visit the Bar Convent (2), England’s oldest living convent; it has a heritage museum and a café in the walled garden. The bottom half of Micklegate Bar dates back to the 12th Century. The top storey was added in the 14th century to accommodate a portcullis and a barbican. Go on around the city walls and, eventually, down steps onto Skeldergate. Turn right to the main road, left over the River Ouse, and left on Tower Street to visit Clifford’s Tower (3), the remains of York Castle. The views from the top stretch as far as the North York Moors. 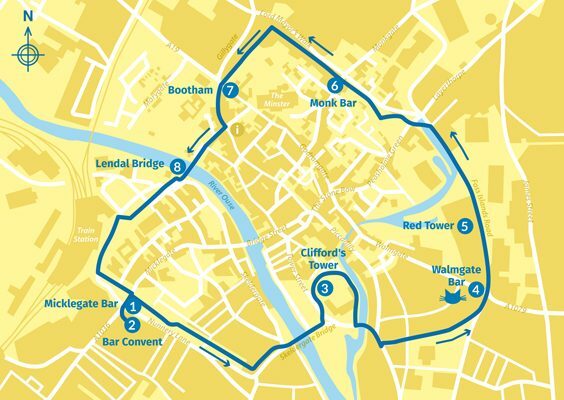 Return to Tower Street, follow the road over the River Foss, cross Piccadilly, and climb back onto the wall through the arch ahead. 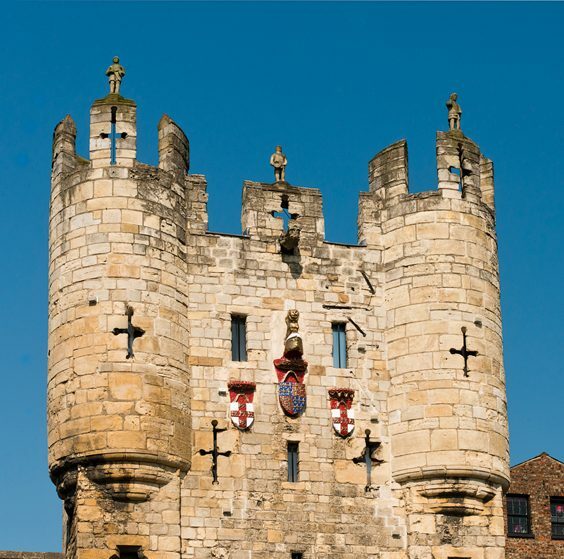 The next big gate is Walmgate Bar (4), which has a café inside the tower. Go on along the walls and, at the end, turn right around the brick-built Red Tower (5). The next section was once a huge swamp so there was no need for a defensive wall. Turn left along busy Foss Islands Road, soon walking beside the River Foss. Cross over Peasholme Green to re-join the wall. Follow the walkway again to arrive at Monk Bar (6), complete with medieval toilet and portcullis. Head down the steps onto Goodramgate and look for a little doorway beside the arch to take you back up to the top floor of the gatehouse, passing the Richard III Experience. 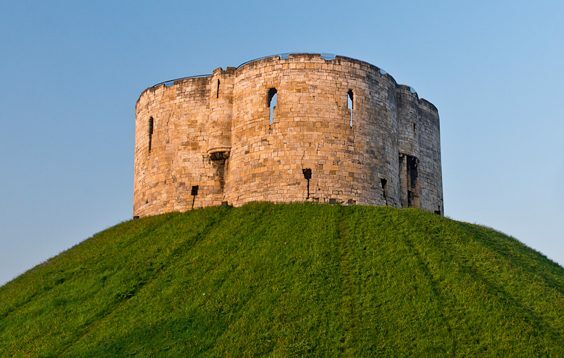 Clifford’s Tower, the remains of York Castle, dates back to the 13th century. It has been used as a treasury and a prison. Go on, past views of York Minster and across lovely gardens, round a final corner to reach Bootham (7), where the walkway goes through the room above the archway and then ends. Through the floor of the Croque-Monsieur café, built into the gate, you can glimpse the Roman defences underneath the medieval walls. Keep ahead at the foot of the steps, past the Theatre Royal, towards the Visit York Information Centre. This is the starting point for the next walk, which explores Roman York, including the ruins in the nearby Museum Gardens. Turn right along Museum Street and cross Lendal Bridge (8) to return to the station. SPOT THE CAT: Look towards a ledge outside the lower window of the café at Walmgate Bar.